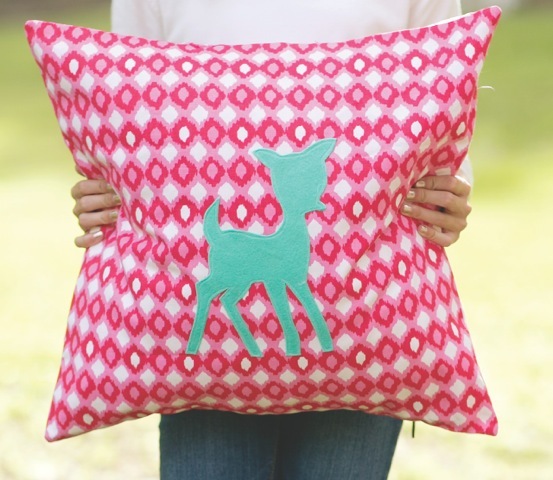 This adorable pillow project will get you in the holiday spirit. Make some for the holidays or change up your fabric and make one (or many) for any time of the year! - This is a project for confident beginners. - The kids will learn to sew straight lines, to turn corners, and to sew close to the edge of the deer appliqué. - The students will take home a finished pillow with or without a pillow form. - Children can express their personalities with fabric and felt choices. Approximately 1.5 hours with children who have sewing machine experience. Each student should have a sewing station with a machine and an iron nearby. 1.Trace deer design onto fusible web. 3. Iron fusible web to wool felt and then cut out deer shape. 4. Iron wool felt to pillow front piece. 8. Pin front and back pieces together. 11. Turn pillow right side out and insert pillow form.